Scorpions in Arizona – Most everything you wanted to know and some things you didn’t! If you live in Phoenix or are thinking about moving to Phoenix, you’ll have to come to terms that we share the desert with these anthropods that are reported to have been around for millions of years! The bark scorpion, the most notorious because it is the most venomous, measures 1 – 2 inches and like most scorpions is relatively inactive during the day. Most stings occur at night during the warm summer months. Scorpions are nocturnal, predatory creatures that feed on a variety of spiders, insects, centipedes, and other scorpions. To set your mind at ease, according the University of Arizona, there have been no reported deaths in the U.S. due to scorpion stings. Read on to find out how to minimize contact with our infamous desert mascots. This summer a couple of clients moved into their new residences and then called me for advice on how to deal with scorpions. I realized that I was unprepared on how to advise them except to say that they should consult a pest control professional because I’ve never had to deal with these cozy creatures in my house. I came across some interesting assertions and decided they were worthy of confirmation. The first claim described how scorpions can withstand being frozen and located close to nuclear blasts without any affects. The second assertion or recommendation described how diatomaceous earth is a natural insecticide and very effective against scorpions. The next experiment was motivated by the positive press about how food grade diatomaceous earth is an effective insecticide against scorpions. Diatomaceous earth is consists of fossilized aquatic diatoms, whose spines cut through the exoskeleton of the scorpions causing it to dehydrate and die. It has to be food grade DE, not the kind found at a pool supply store. 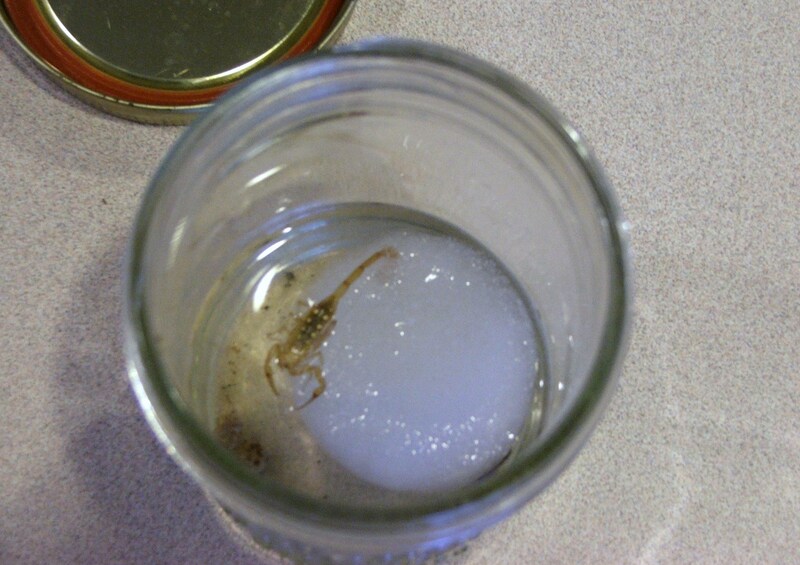 I used a glass jar since scorpions can’t climb glass and put the scorpion in the jar where I had sprinkled an insecticide made with food grade diatomaceous earth, and waited. I eagerly checked the next morning to see if it was as quick acting as the scorpion that couldn’t swim or just froze to death! It was still alive. After about a week it was still alive but it was evident that any movement of the jar appeared to make the scorpion uncomfortable. It wasn’t until about a week and a half that the scorpion finally died. Obviously, this is not a fast acting method. The amount of food grade diatomceous eart insecticide was high compared to what normal exposure would have been. A fundamental way of controlling scorpions is to control the environment. Insects are scorpions food source, so control the insects and you are more likely to control the scorpions. 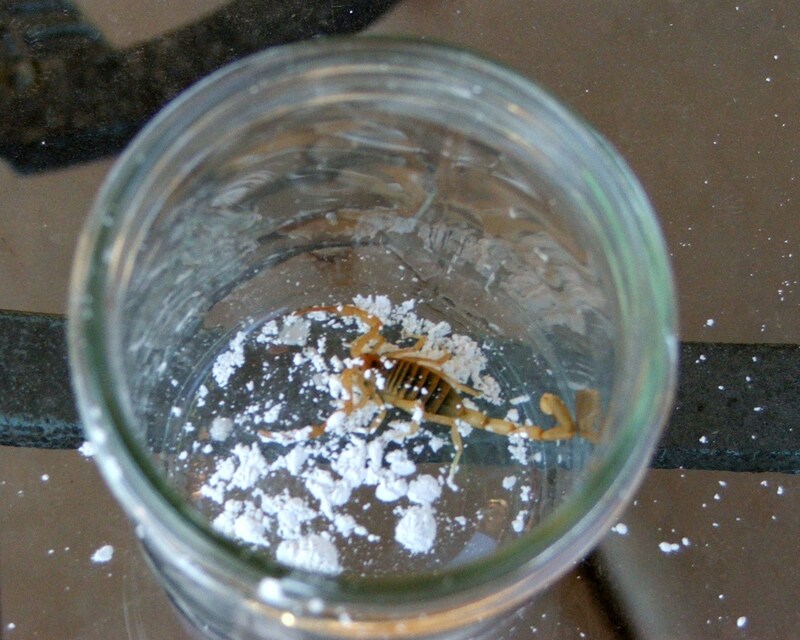 Here are some basic tips that will make your home and yard less attractive to scorpions. Remove wood and rock piles, stacks of wood, etc. Remove all trash, debris, boards, stones, and other objects from around the home. Store garbage containers on a frame that allows them to rest above ground level. Never store firewood inside the house. Place it directly on the fire. Plug weep holes on the outside of the home with steel wool, pieces of nylon scouring pad or small squares of screen wire. Caulk around roof eaves, door frames, pipes and any other cracks into the home. Window screens must be in good repair. Make sure they fit tightly in the window frame. Interestingly two of the clients that had scorpions ended up with the same treatment methods, and they have reported positive results. They involve a do it yourself application of insecticides that have been effective in getting rid of scorpions. * Cy-Kick CS A multi-use insecticide for indoor and outdoor use, Material Safety Data Sheet, and * Delta Eight Granular Insecticide for use outside of the home. Both of these are available at pest control stores. 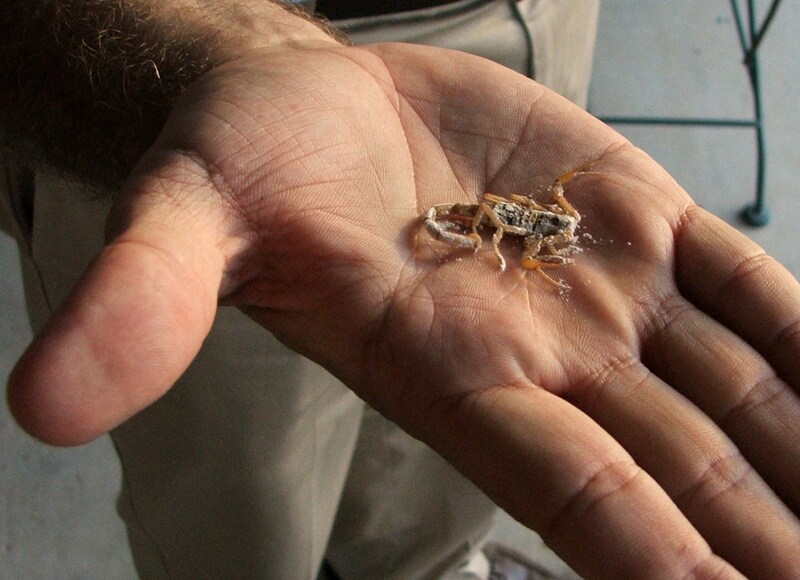 If you have had scorpions and been successful eliminating them, please tell us about it in the comments section below.